On the afternoon of February 1, 1953, the Pro-Cooperative commission, together with the attending neighbors, agreed to the establishment of the Agricultural Cooperative “San Jaime Apóstol”, with 122 members, after emphasizing the importance that this would be for everyone. The first president of the Cooperative was Isidro Martí Serra, and the governing board consisted of: José Martí Serra, Juan Nogué Vilalta, Antonio Segrià Mort, José Nogués Estivill, José Casas Gomis, Antonio Dalmau Cunillera, Pedro Blanch Rius and José Viñas Will play (Ropes). In the Act of constitution, which is still preserved in the Cooperative’s offices (you can see digitization 1 and 2 ), you can read all the details. In the same year, the land was purchased at the current location, Avenida Verge de Montserrat, for 20,000 pesetas and the construction of the building had a cost of 72,380 pesetas. In 1954 the Cooperativa was put into operation, in the building that is still in use at the moment. The machinery of the mill is bought and installed for a cost of 550,000 pesetas. His main activities were the elaboration and commercialization of oil and wine . 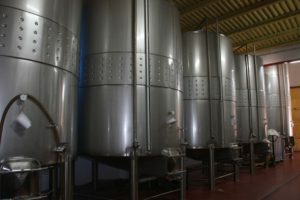 It was not until 1961 that the machinery of the winery was bought and installed for 225,000 pesetas and the cups were constructed (at a cost of 1,1,000,000 pesetas). In 1969 the C / Saltadora building was purchased, where there are currently the Cooperative offices and in 1975 an extension of the cellar is made with a budget of 1,218,000 pesetas. During the 1980s, new machine additions were made to facilitate the work in the cooperative: the hazel breaker, the oil mill expansion, the mixer, the oil tank. In 1986 the oil packing was bought. At the beginning of the 90s, a series of extensions are made, both in the oil mill and in the cellar, and new electrical machinery is installed to improve the processes of oil production. In 1996 the organic olive cultivation began, and on 13 May of the same year, the statutes of the Agrupació de Defensa Vegetal Olímpica – Cooperativa Sant Jaume Apòstol d’Ulldemolins were approved, to facilitate the production . The Cooperative thus becomes the first Catalan cooperative and one of the first in Spain that produces organic olive oil , representing at that time around 30% of the production, about 50,000 kilos of oil Due to this new production, an expansion of the mill is carried out in 1997. In 1998, the Agrobotiga was created, where you can find the products that are made in the Cooperative, as well as others from the village and the region. At the same time, it performs the functions of the tourist information point of the town. In the same year, the offices of the cooperative are equipped with computer equipment, which helps to manage all the activities that are carried out. And one year later the wine packer is bought. On May 12, 2000, the Department of Labor approved a subsidy of 290,470 pesetas (1,745.76 euros) under the name of Agrícola de Sant Jaume SCCL, for the purpose of constructions, machinery and installations of the Agrobotiga. In that same year, the wine of Ulldemolins stops belonging to the Tarragona DO, in order to become part of a new creation: the DO Montsant. In 2005, the Cooperativa Agrícola Sant Jaume Apòstol, SCCL , became known as Agrícola d’Ulldemolins Sant Jaume, SCCL. In ???? It begins to make oil of integrated production , which combines techniques of conventional and organic production.